Freshman Interest Groups (FIG) are a way for new students to connect with others who share similar interests. College is a place for educational and personal growth, a place where students begin finding their place in the world. Florida State University is doing its part to help students during that process through its new initiative, Engage 100. The initiative is designed to enhance the student experience by connecting, engaging and challenging them from the moment they first arrive on campus. Right now, about 40 percent of FSU students are involved in programs such as Undergraduate Research, Freshman Interest Groups (FIG) and Living Learning Communities (LLCs). Now, the university is broadening those efforts. 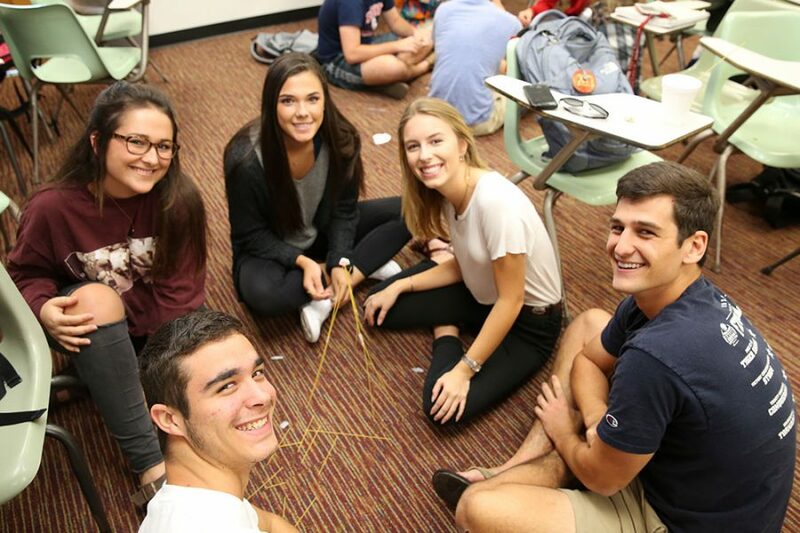 Engage 100 connects students to FSU by creating an atmosphere where they are immersed in activities, making friends and growing both academically and personally. This fall, Engage 100 will offer two new zero-credit courses — one taught through the Innovation Hub and another through the Student Disabilities Resource Center. The university is encouraging departments and units around campus to develop more curricular options. “We’re finding people who can support students and connect them with like-minded individuals and university experiences,” said Alice Wright, director of retention and Engage 100 coordinator. Most of the Engage 100 courses are free for students, and by creating experiences in a curricular setting, administrators will be able to measure the effectiveness of the program. “If we have a class that will meet at least eight times within the semester, it gives us a way to validate a student’s level of participation, engagement or effort and determine if it is creating a positive effect on the student’s ability to get connected,” Wright said. While the program benefits new students by helping them develop personal, social and professional awareness and skills through participating in activities that align with their academic and personal goals, it also aims to address hurdles that can be detrimental to retention, such as a student’s distance from home. 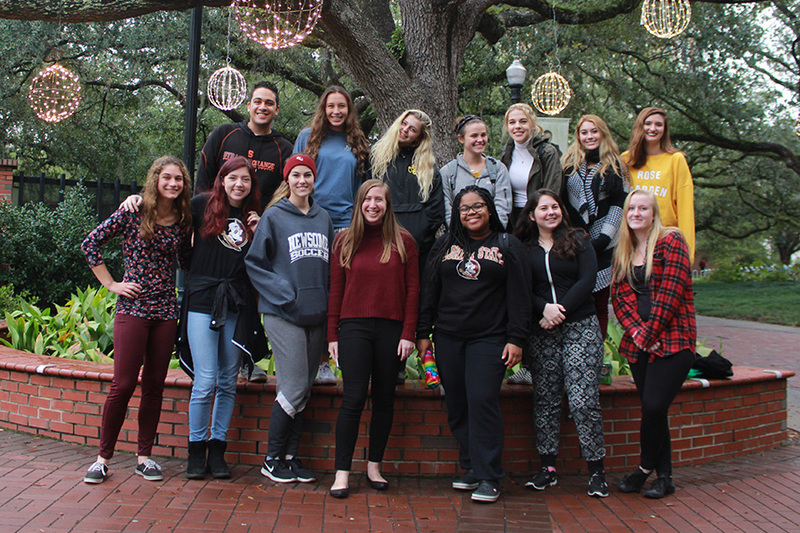 About 40 percent of FSU students are involved in programs such as Undergraduate Research, Freshman Interest Groups (FIG) and Living Learning Communities (LLCs). FSU is broadening those efforts. Life Coaching provides selected students one-on-one attention and mentorship during the academic year from a coach who is committed to student development and success. Coaches actively assist incoming students with their transition and help define academic, personal and career paths. CARE provides preparation, orientation and academic support programming for students who are among the first in their families to attend college and traditionally underrepresented students disadvantaged by virtue of educational and socioeconomic reasons. Freshman Interest Groups provide a way for new students to connect with others who share similar interests. FIG places participants in a set of classes that have a specific theme such as business or communication. The Honors Program at FSU is a caring community of dedicated staff and talented students providing support and encouragement to aspiring scholars. Honors courses typically have no more than 25 students to provide personal contact with faculty. Honors classes are taught by distinguished faculty from all disciplines who are committed to bringing undergraduate students into their laboratories, studios and theaters, not only to learn but to act as initiators and researchers at the highest level of scholarship. Living-Learning Communities (LLC) are small groups of students who live together, share an interest and take one or two of their classes together — usually in small classrooms inside their residence halls. An LLC offers a supportive network of students and distinguished faculty from the time students arrive at FSU. Inquiry, investigation and discovery are at the heart of Florida State’s mission. Every faculty member is engaged in groundbreaking original scholarship, and as an undergraduate, students can join faculty in their work in laboratories, libraries, studios and beyond. Students can connect their classroom learning and intellectual interests as they work with faculty members, graduate students and startup companies on research and creative projects. For more information, visit engage100.fsu.edu or contact Alice Wright at acwright2@fsu.edu.